On July 4th 1922, 2nd Lieutenant Joseph Aloysius Hurson, ‘A’ Company 2nd Battalion Belfast Brigade Na Fianna Eireann, was shot in the head by a sniper at Regent Street in Belfast. He subsequently died in hospital. Joseph, son of Mathias and Ellen Hurson, lived at No.87 Unity Street in Belfast, and was an apprentice cabinetmaker. He was only 16 years old at the time of his death. Joseph had been a dedicated and active member of Na Fianna since he was 12 years old. When Joseph’s mother Ellen applied for a pension in 1927 as a surviving dependent of Joseph, her claim under the Army Pensions Act was rejected. She claimed she was reliant on her eldest son Joseph bringing in a wage to support the household. It appears that her husband had died by 1927. Ellen responded to the Department of Defence asking “why, when I have lost a son worthy of the name of an Irishman, I should be ignored?” She requested that they reconsider their decision; however, she was unsuccessful in her attempts. “We, the Officers and men of ‘A’ Company, 2nd Battalion, Na Fianna Eireann, desire to express our heartfelt sympathy for you in your sad bereavement. Your loss is our loss. You have lost a kind and devoted son and we have lost a true and brave comrade. Joe was a brave and cheerful officer, always cool and fearless in the face of danger. He always had a kind word for everyone. He had a great love for his country and was always willing and eager to perform any deed, no matter how dangerous, to advance the cause of his country. Words cannot express our sorrow. We will always remember him as we saw him the night before he died, brave and cheerful – a true son of Ireland. 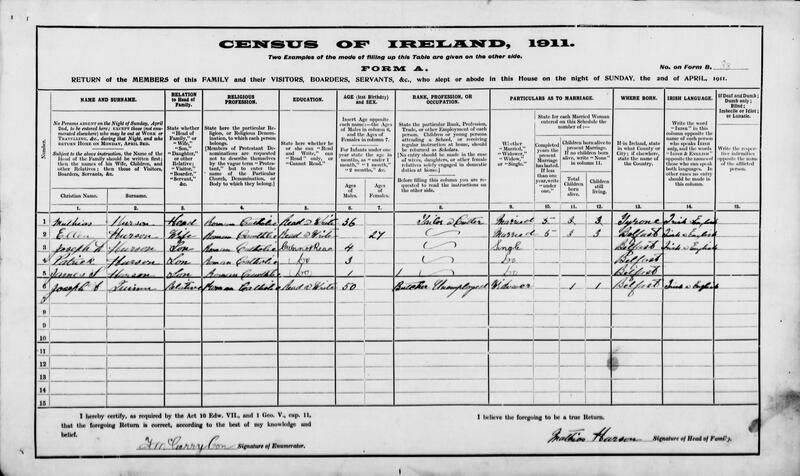 Census Form courtesy of Irish National Archives. Death Certificate courtesy of Irish Military Archives. Story and research by Eamon Murphy. This entry was posted on Saturday, July 4th, 2015 at 9:25 am	and posted in Fianna articles archives. You can follow any responses to this entry through the RSS 2.0 feed.